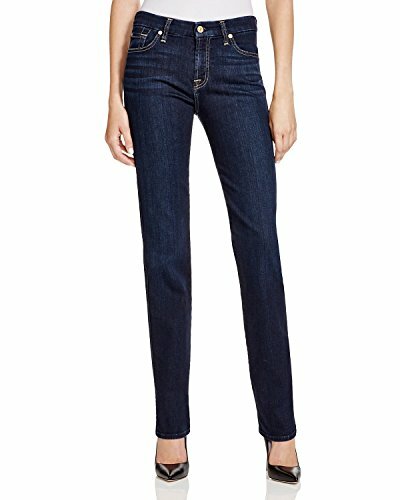 7 For All Mankind Women's Size Chart Flaunt it in some seriously chic denim. The curve-hugging Kimmie has a mid rise and contoured waistband to prevent gaps. Silhouette-lengthening straight leg. Dark Dusk Indigo is a dark wash in a deep indigo hue. Light hand sanding draws out textured, vertical slubs while whiskers finish the look. 10 oz stretch denim. Beige topstitching. Gold-tone hardware. Navy brand labels at the back waist and pocket. Five-pocket design with tonal squiggle at back. Belt loop waistband. Zip fly and button closure. 90% cotton, 8% polyester, 2% spandex. Machine wash and tumble dry. Imported. Measurements: Waist Measurement: 27 in Outseam: 41 in Inseam: 33 in Front Rise: 9 in Back Rise: 13 in Leg Opening: 13 in Product measurements were taken using size 26, inseam 33. Please note that measurements may vary by size. Flaunt it in some seriously chic denim. The curve-hugging Kimmie has a mid rise and contoured waistband to prevent gaps.